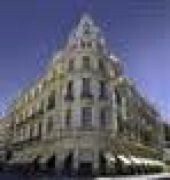 The Esplendor Savoy Rosario has design accommodations in central Rosario. There is a restaurant and a rooftop terrace. The main pedestrian street is 215 yards away and the Parana River is a quarter mile away. Spacious and bright, the rooms at Savoy Esplendor Rosario feature stylish, modern decor. They include free Wi-Fi, cable TV and work areas. Parquet floors and soft-colored, the upholstered sofas provide them with a warm atmosphere. A breakfast buffet, including fresh juices and pastries, is served daily. The restaurant has a wide variety of Argentinean dishes and live tango shows. Drinks from the bar can be enjoyed on the rooftop terrace. Spa facilities include a sauna and a fitness center. The 24-hour front desk can arrange for shuttles to Fisherton Airport, which is 10 miles away. Esplendor Savoy Rosario is 3.5 miles from the Bus Terminal, and half a mile from the National Flag Memorial and from the Rosario Cathedral.